I got a solar bird bath for the patio birds. The last bird bath I had, a squirrel tipped the top over and broke it. This top screws in to the base, and therefore won’t be easy to tip over. Plus it’s quite heavy. See the cute little turtles on each side. They came separately with a spike that goes in the two holes where they’re situated. My objective is to a have a natural wildlife habitat in the city on an apartment patio. And it can be done. The flat marbles I’ve collected over the years and brought from Texas are a temporary fix now, as they aren’t yet glued down. I’ll get to that later. But this will keep weeds from growing up through this long gap. 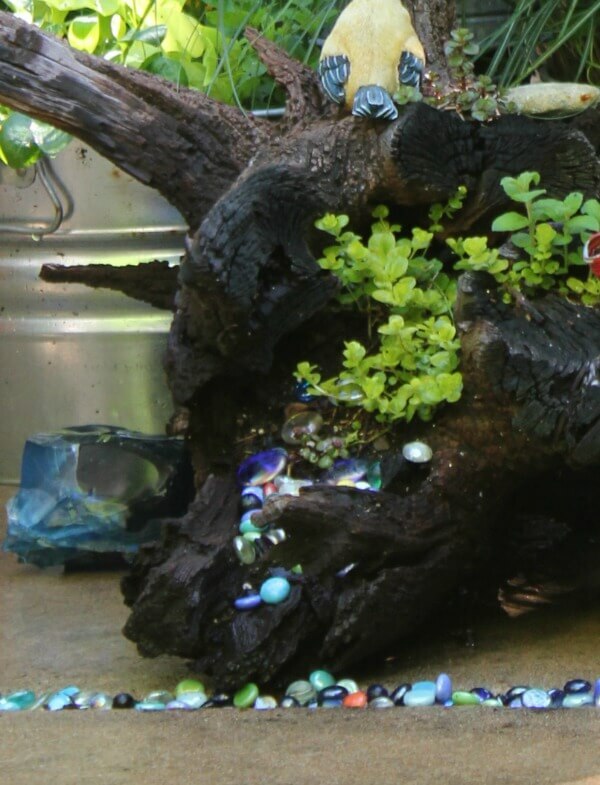 Notice how I arranged the marbles so it looks like they’re spilling out of the driftwood? To get a better idea of how big this patio is, and some of you have asked me about this, see how much concrete patio there is before you even get to the gazebo by the back patio doors. See the edge of the gazebo? So there’s at least ten feet back once you see that. The gazebo is 10 feet by 10 feet. Not sure if that is from pole to pole or not. While I was digging around for my box of marbles, I came across this little glass jar of beads. I brought them out here because the colorful beads are pretty when the sun hits them. That's a great thought: it looks like a little colorful creek. Oh Brenda it looks beautiful. The only thing about gluing down your marbles is that if you ever move would you have to leave them there or could you pull them up? I don't use my good marbles. These are those you can get at Hobby Lobby in packs and they are flat. So I'd probably leave them. Doubt I'm going anywhere though. Israel said he needs to put something dry along the crack like that plastic stuff you put down to keep weeds from growing. Then he's going to cement them from the bottom. At some point anyway. He's still pretty busy cutting limbs to make sure the bird bath gets enough sun! How fun is this. Your patio is looking great. You are all set for summer. And so are you with that fancy water fall your kids set up for you! Great views of your patio, everything is doing so well. The colourful rocks in the concrete crack really perk things up. 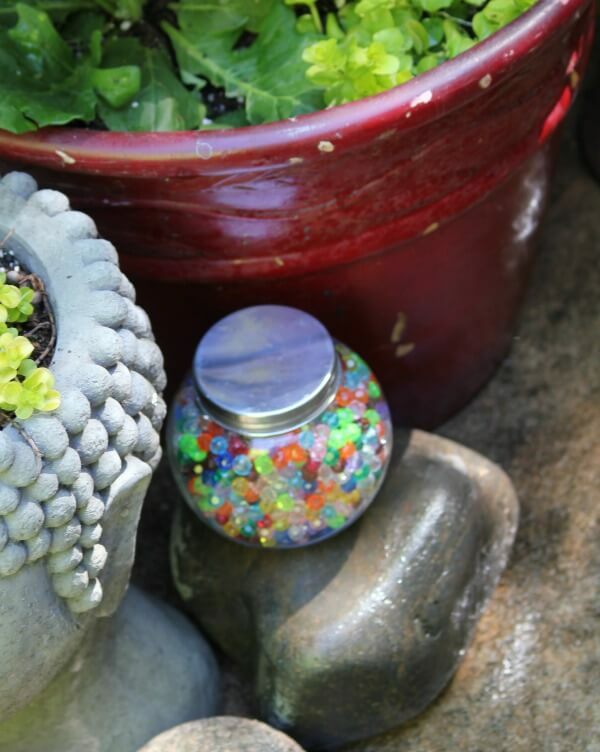 I love what you did with the marbles, Brenda – super cute! You'll have to let me know how that solar birdbath fountain works – I've looked at them before but I've been hesitant to pull the trigger. Enjoy that beautiful space you've created – it's surely an oasis in a busy city!! As long as there's sun, it's running. 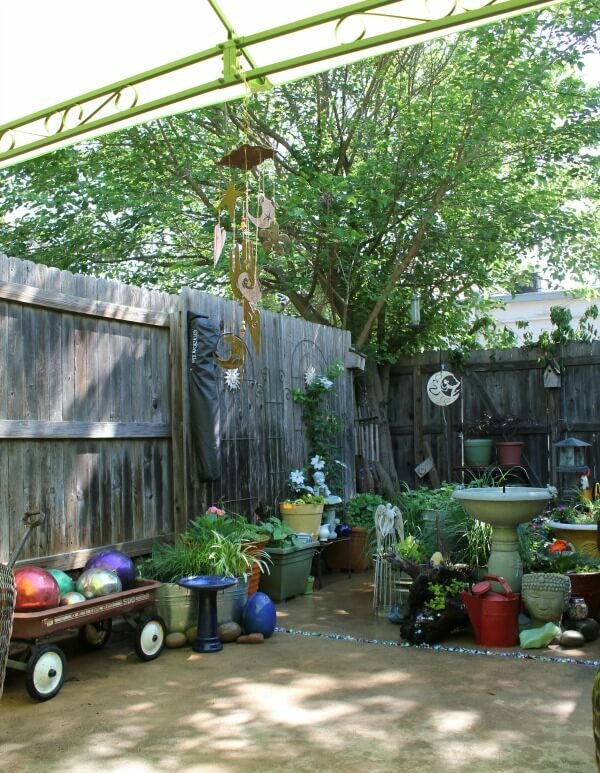 I love how large your outdoor space is and fenced. Mine is small with a small concrete pad and grass won't grow out there. I may add some additional patio blocks to make it larger and not so ugly. You have given me so great ideas! I just love my fenced-in patio! Love the marbles idea! Also, you could plant some thyme in those cracks. As long as that area gets some sun. I did that once and the heat got it. I don't take vacations. I don't go to movies. I'm a homebody because I love to be and because of my ankle. So I make the most of it. When I saw your red buffalo check curtains I had to have them to ordered right away from Primitive Star Quilt. They came very quickly and love, love them. They hang while my bedspread if black toille. Thanks again. I will go over there and enter. I love your birdbath! A solar fountain is a great idea…why haven't we had that before? I also like that your birdbath isn't likely to tip over. A couple of weeks ago my MIL heard a big thud in the night…the bowl of her birdbath was on the ground the next morning. When she lifted it up there was a mama opossum and her deceased baby under it. Those bowls are dangerous! You have really transformed that area. Your landlord should be very pleased. Israel said he showed the manager a picture of the patio on his phone and she was very surprised. Nobody around here much does anything with their huge patio, and that's such a shame. Your patio is really taking shape! Cute birdbath too. LOVE LOVE LOVE THAT!!! Love the whole patio scene. Will take a look at that on Wayfair.. I love everything solar, I have a lot of fun little solar pot stake lights and lanterns and it makes the patio very magical at night. Love how bit the patio is, to me the perfect size. Would love to downsize my backyard. With the drought you can't really even keep pots alive with the water allowance. 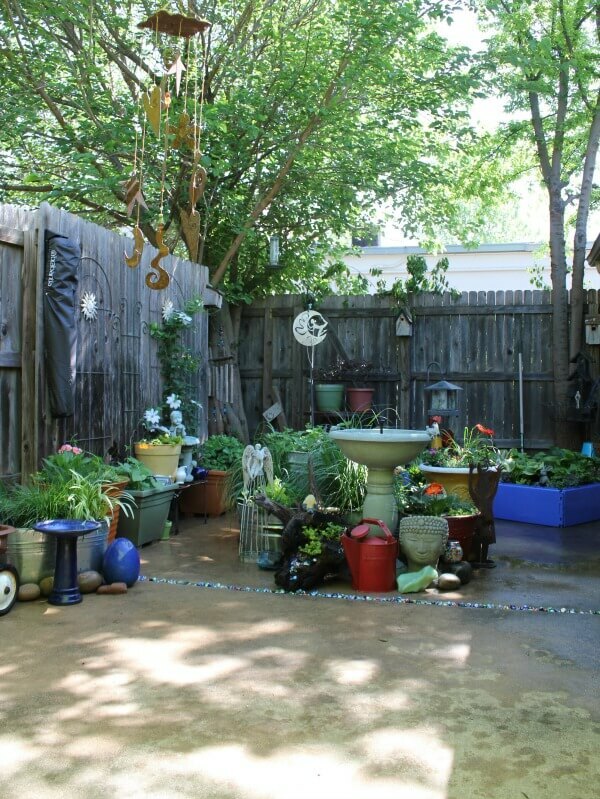 (and have clean bodies and dishes and clothes) Your patio looks like an oasis. Love it. Your patio is a vacation in itself. Love it, so beautiful, so charming, so you…You have the most wonderful ideas..Bonnie in WI, waiting for flower planting weather.. I'd love to be sitting there right now with a cup of tea. 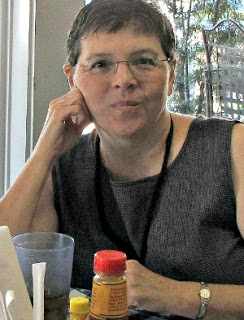 I just found your blog and I'm glad I did. I love small living. Have a great weekend. So pretty! I enjoy all your posts, but I especially enjoy your outdoor project! Your plants and flowers are to die for!! The large patio space is amazing. 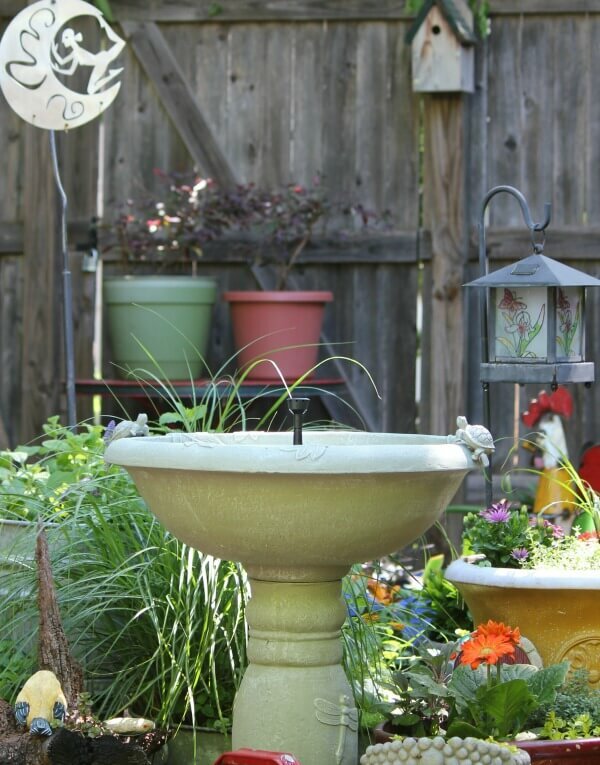 Love the bird bath and being solar is awesome! 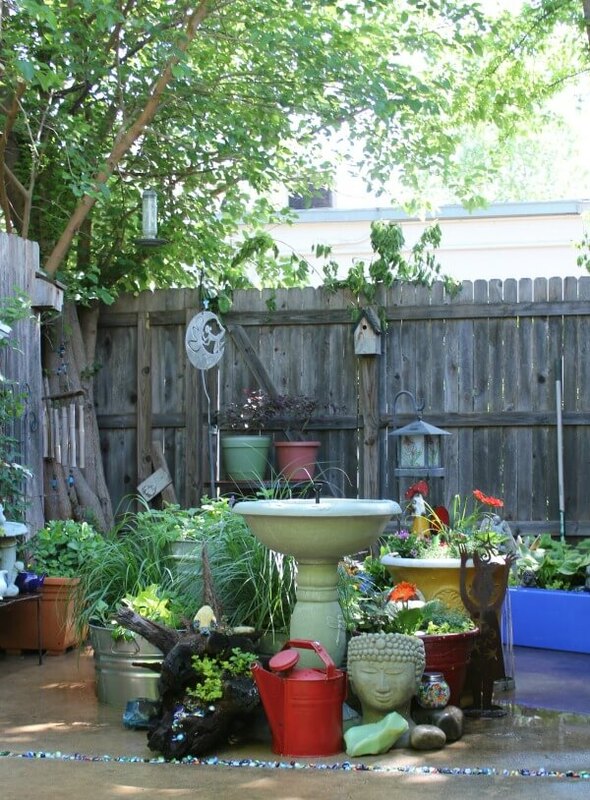 Your patio is just beautiful, and I know you and the pups must really enjoy it! I really love the colored stones in the crack, how in the world did you think of that? I went right out and got some for a large crack I have in my patio, and I just love it!! I got turquoise and green ones. What kind of glue are you going to put on them? I use my blower to clean off the patio, and I don't want mine to blow off 😉 Thanks for the great idea! !